The blankie was an easy knit, just alternating strips of the bobbly-lacy pattern from the 5-Hour Baby Sweater and straight stockinette. The booties are likewise easy little charmers – it takes about an hour start to finish for me to do one, mostly because of the incessant interruptions I have around here. I’ll bet if I could just start knitting and not be pestered fourteen times a minute, it would probably take about 45 minutes. Unfortunately, the ties are crocheted. Even just doing a stinking chain, I cannot seem to have a nice, even stitch when I crochet. And while I know that the best cure for this particular lacking on my part would be practice…well. I hate the way my crochet looks so much that I find it impossible to practice. 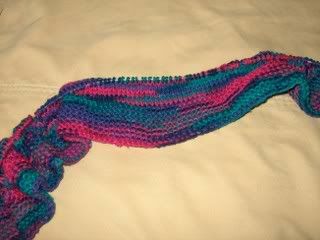 As the variegations are rather…um…striking, I’m going to do just a straight stockinette on this one. While it looks good in garter, too, I think the stockinette will tone down the ‘pop’ a little bit and let the colors blend a little more. That’s my theory, anyway. Because this is a fairly intense colorway, and needs all the toning down I can bring. 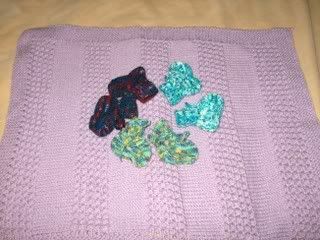 You know, babies love bright colors, so I think the blankie will be just great. And the booties are adorable! What is it about teeny-tiny footwear that is so appealing? Maybe more so because my "babies" all have bigger feet than I do now...sigh... And how are the eyeballs? That really WAS a weird weekend! Red heart has some great varieagated, and I'm a yarn snob, saying it!